Scorpio knows the mystery — magic, miracles, and manifestation all come from the same place — darkness. Scorpio teaches us to embrace the darkness. For it is within the darkness that we discover the secrets of the universe and awaken to the light of our soul. Scorpio is about discovering the secrets of life. Its penetrating psyche and deep emotional waters have access to the unknown and the powers that create, enliven, and destroy. At the solar eclipse the Moon blocks the Sun’s light. During a solar eclipse the various forms of energy that the Earth receives from the Sun are disrupted causing old patterns to dissolve, new pathways to appear, and shifts in consciousness to occur. The impact of this Solar eclipse will be felt most where 0 degree falls in our natal chart. Check the house and any planets that you have within 3 degrees of 0 degrees Scorpio. Solar eclipses serve as catalysts to let go of the past and to initiate a new phase in our lives. Shifts in consciousness are the foundation for peacefully releasing the familiar and stepping into the unknown future. Venus joins the Sun, Moon, and asteroid Pallas all in Scorpio at the New Moon Eclipse, highlighting the power of love, harmony, honesty, and the truth. What patterns, behaviors, desires no longer server you? Maybe they never did. What repressed feelings are imprisoning you? It is time to let go and move to higher ground. Scorpio is about continual transformation and evolution of consciousness. We must release the old to create space for the new. In Scorpio territory we get in touch with our illusions, bad habits, and naiveté. We must become conscious of what we fear, what we suppress, and what we hold on to that is not authentic. Scorpio territory is largely unconscious. It thus takes serious introspection and deep feeling awareness to realize what hides in our subconscious and to identify (and admit) how it controls our thinking, feeling, moods, responses, and way of life. We need to understand that what we call our shadow is energy where the light of our soul has not yet been allowed to shine. Our dark side is not bad; it is asleep. Within the darkness our potential and gifts lie dormant. Our awakening process transforms the primal energies of our soul into powers — courage, strength, patience, kindness, compassion, and humility. As a fixed sign, Scorpio has the power to focus and to commit. Scorpio must, however, not indulge its fixity to resist and stay stuck. It is true for all signs of the zodiac that their innate qualities can be used in both productive and destructive ways. The tenacity of a fixed sign can be very helpful in keeping us on course, but we must make sure that the course we are on is the right one for us. Fortunately Scorpio has the will power and the courage to penetrate to the truth. Mercury hovers in a stationary position at the New Moon, before going direct 2 days later. Take advantage of the fact that our rational mind loses a bit of its grip, giving us the space to meditate on stillness and to feel deeply. At the New Moon, Neptune in Pisces trines the Sun, Venus, Moon, and Pallas all in Scorpio. The exact trines follow the next few days. (listed below) The water trines bring heightened sensitivity and deepen instinctual awareness. Take advantage of these emotional waters to choose love over fear. Forgiveness of others and ourselves is easier when we accept our humanness. The portal to higher love is entered through deep feeling and sensitivity. The reality of our soul is love. Self-love opens the door of the heart to this eternal truth. October 30 – Neptune trines Pallas. Take responsibility for your own life and be your own authority. The Taurus Bull is concerned with how we deal with the physical plane — our body, our resources, our money, and Mother Earth. What do we value? How do we value ourselves? A major Taurus lesson is to recognize our own self-worth. As we learn to value ourselves, we find that we don’t need to prove anything to anyone. This self-validating stance is the foundation for emotional security. The Taurus/Scorpio polarity pair helps us understand that wealth is about what matters most to us and what makes us happy. This pair invite us to ask — What do we really need? Does what we need and what we desire match up? Taurus wants to enjoy the beauty and physical pleasures of life on planet Earth. Scorpio reminds us that our ability to enjoy life is a function of the nature of our inner reality. Scorpio confronts us with the subconscious programming that is holding us back and preventing us from being free, happy, and at peace. In Scorpio territory we are obliged to identify fear driven beliefs, attitudes, emotions, and behaviors. We can then transmute fear energy through consciousness to love. As we do so we uncover the riches hiding in our unconscious — in the darkness. Our passion and will can then be directed to what is real, authentic, and worthwhile. The Scorpio/Taurus polarity pair is about (1) awakening to the subtle reality of our emotional body, (2) learning how to contain our emotional energy in our body, (3) expanding our sensory awareness into the feeling sensitivity of the flowing feminine polarity of our soul, and (4) enjoying the gift of our in-the-body feeling experiences. Scorpio and Taurus remind us that the depth of being, the profundity of existence, and the ecstasy of being alive in a human body await us. This consciousness cannot be intellectually discussed because it is not a mental topic. It is a feeling of love that can only be experienced when our emotional body is at peace and feels welcome in our physical body. Mars conjunct Pluto helps us (1) identify our hidden agendas, (2) be honest with ourselves, (3) be clear about our motivations, and (4) redefine our intentions. Mars in Capricorn square Uranus in Aries can be disruptive and disturbing if we remain inactive. Use your fire energy to take constructive action. Don’t get caught in useless power struggles. Intend and work toward a positive change in order to avoid a disastrous wake up call. Venus conjunct Saturn in Scorpio helps us love ourselves while we face our shadow and identify recurring patterns. Venus reminds us that self-love is needed to extricate ourselves from chronic struggles. We are invited to be resourceful and to make choices based on what we love, not from social conventions. The dance of the heavenly bodies give us ample opportunities to elevate our feeling sensitivity and consciousness to a place where we can enjoy of the ecstasy of being. Austin, Stephanie, ‘Scorpio Solar Eclipse – October 23’, ‘Taurus Full Moon – November 6,’ The Mountain Astrologer, Issue #177, Oct/Nov, 2014. 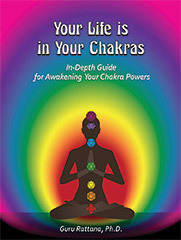 (1) In my new revised, second edition of Your Life Is in Your Chakras I explain how to practice Kundalini Yoga to direct the juice ‘ojas’ of sexual energy to feed our brain and awaken consciousness. To my friends in Northern Europe, I am holding workshops in November in Gothenburg, Stockholm, Copenhagen and Gjøvik (Norway). Some places are still available. Full details from Yoga Technology. Sikh Gurus spoke against other empty ritualistic practices of their time. The spoke against idol-worship or belief in gods and goddesses; astrology and fortune telling; tantra, mantra and yantra; hattha yoga and maceration of body; pilgrimages and the notions of good and bad days, places and omens; dress or deity. They also decried other negative practises like: dishonesty, slander, falsehood, alcoholism and drug addictions, breach of faith, and violence. The Gurus disapproved of renunciation of the world and sanctified the life of the householder. Dr Guru Rattana if you like Astrology, Prophecies and Sikhs, you may want to read a very interesting and amazing book titled: ” Astrology, Prophecies and Sikhs ” written by an American white lady who studied Bible and Sikh Scriptures for 40 years and published that book. It is available on Amazon.com and Barnes & Nobel for only $ 6.99, but you may find a used/scratched for $ 4.00 . Blessings.